Once a year we leave our civilized home and head for the boonies of Northern Ontario, Canada. Our lakeside cottage is named the Cambrian Cabin, but has been called the Big Red Barn by young Margaret Wise Brown fans, and houses our boat Old Smokey. We go days without showers, weeks without pedicures and a forever of August without wristwatches, computers and schedules. 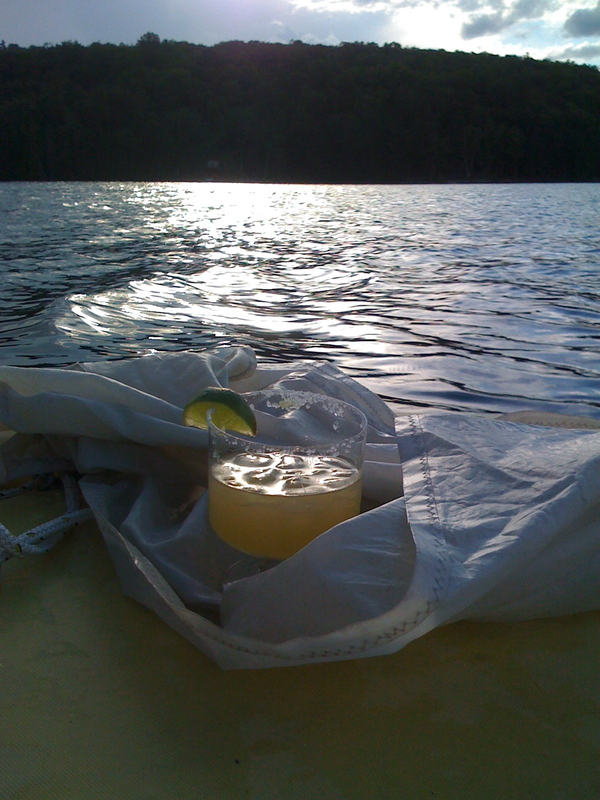 Our only constant is 5 pm cocktails on the dock and watching the day slip into night. We sit quietly and spy loons, dragonflies, mosquitos and even bats as the pink sun sets into the trees and night falls. We light the bonfire, make smores and gain at least 10 pounds by the end of the month. Sound like heaven? Sound like bliss? The kids run barefoot all in and around the lake. The dog needs leash nor collar and she roams as freely as the kids. It’s definitely a quieter, gentler existence. The people are friendly, you know all of the neighbors and there is a natural neighborhood watch that defies forming an official group and posting signs. Days are spent in the hammock. Swimming, sailing, wind surfing, kayaking, and canoeing are the modes of transport. The lake is quiet, clean and sleepy. There are lily pads, gargantuan dock spiders, frogs, toads and fish of every size to catch, study and throw back. At night the stars glisten and shoot across the sky. The milky way swims above our heads as we watch in wonder. This is the kind of sky that makes you contemplate the universe–where does it begin? Where does it end? We stay up reading pointless novels and we sleep in lazy and late. The water laps against the shore, the loon calls and it is the essence of summer through and through. This entry was written by Mermaid and posted on September 3, 2008 at 9:01 pm and filed under Canada, Good Old Summertime with tags Canada, cottage, Ontario, summer. Bookmark the permalink. Follow any comments here with the RSS feed for this post. Post a comment or leave a trackback: Trackback URL. Sounds lovely. I seem to have run out of good and peaceful thinking places as of late — save me a spot next summer. There always will be a chair at our table for you! Anytime, anywhere, anyhow.